My Vacation Lady plans lots of romantic honeymoons for our clients all over the world but we got stumped on how to add romance to a Disney World Vacation. 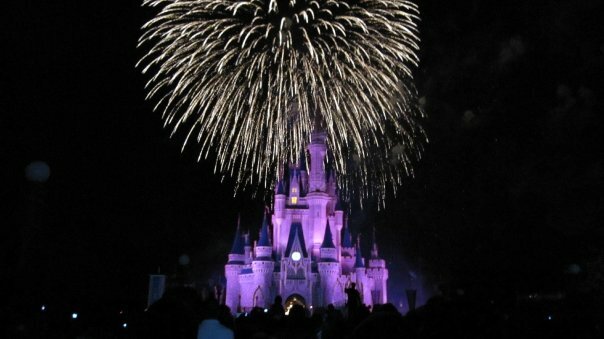 After the last request for a honeymoon to Disney World, we decided that our Disney Specialist, Sharon, should share some of her tips on how to add romance to a Magical Honeymoon in Disney World. Take a horse drawn carriage ride. Sit back and relax on a horse-drawn carriage as you travel through idyllic woodland or along the scenic bank of the Sassagoula River. For 25 minutes, you can choose from a ride along the river at Port Orlean’s Riverside resort or in the woods at Fort Wilderness Resort and Campground. Fireworks and dessert cruise on the Seven Seas Lagoon. Add a little sweetness to your evening aboard General Joe Potter’s Ferry Boat with some mouthwatering desserts and a dazzling water views of the Magic Kingdom Fireworks. Celebrate your honeymoon aboard a pontoon boat. Board your boat at the Magic Kingdom Marina or the Bayside Marina for your semi private cruise around the Disney Lakes. You’ll have a captain steering the boat and you can enjoy each other’s company with some snacks and soft drinks. Rent an Amphicar – What is an amphicar? Part vintage convertible and part boat or water taxi that can drive on land and float in the water at Disney Springs Boathouse. For about $125, you and your honey can be driven by your own Car Captain, with a great view of Downtown Springs, directly from the water. Sail on an Italian Water Taxi Cruise– including a guided tour of Disney Springs, complete with live music, chocolate covered strawberries and a champagne toast. The water taxi carries up to 20 guests but if you want something more private, ask us about the Antique Steamboat Tour just for the 2 of you. Couples Massage– at the Senses spa at the Grand Floridian is perfect to rejuvenate you after a long day in the parks. Dinner at California Grill – at the Contemporary overlooks the Magic Kingdom and if you go for a later dinner, you’ll be able to see the fireworks from the restaurant. Table for 2 in the kitchen – this may not sound very romantic but if you book the Chef’s table at Victoria and Albert’s you’ll have a front row seat for all of the action that goes on behind the scenes! Start the evening off with a champagne toast and the chef will craft your exquisite dining experience. When it comes to making your honeymoon to Disney extra special, our Disney Specialist can help! Contact us to help add the romance into your Disney Honeymoon!